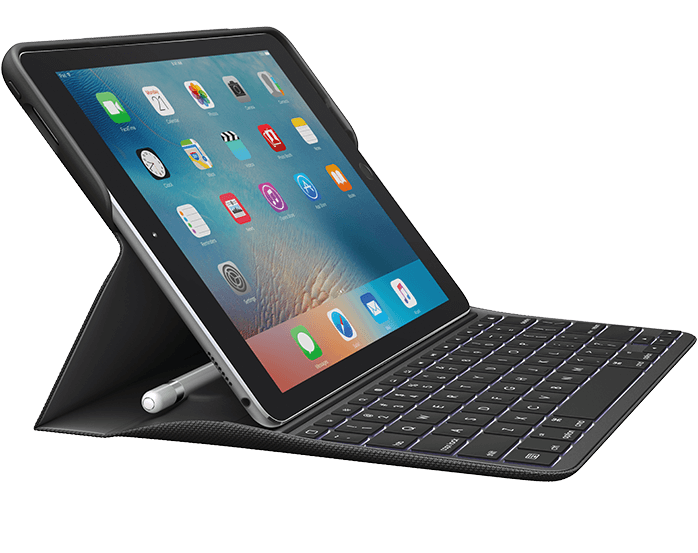 The Logitech CREATE Keyboard Case for the 9.7″ iPad Pro is an exceptional accessory that compliments the already versatile and powerful addition to the iPad Pro lineup. The original iPad was introduced in 2010, and with every iteration and improvement it has shed the simple content consumption device label, and become a more powerful and effective tool. However, even with the newest variant, there are still neigh sayers out there on the fence about the the full capabilities of the iPad Pro, whether it be the 9.7 or 12.9 version. Despite this, the CREATE Keyboard Case makes an undeniable assertion that the iPad Pro will be a more than adequate solution for the majority of users–even the most demanding power users, and here’s why. I’m not that frequent a user of iPad keyboard cases, but I have to say this one looks great. 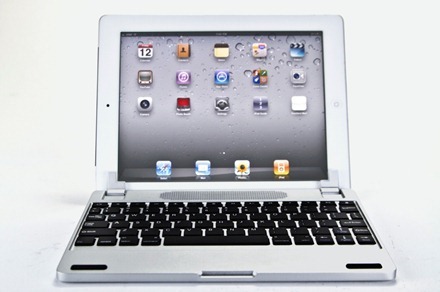 It’s called the VersaKeyboard and it’s touted as ‘the first disappearing iPad keyboard’. If it’s even near as good as the promo video then it’s going to be a heck of a good iPad keyboard case. I’m also optimistic about it because it’s from Moshi, makers of one of my all-time favorite and most heavily used iPad cases – the VersaCover. Detachable Bluetooth keyboard with 130 hours of battery life and LED power indicator. Folding VersaCover doubles as a stand in portrait and landscape modes. Ultra-thin and lightweight design at 13.4 ounces (380 grams). Durable polycarbonate shell includes convenient keyboard slot. Support for iPad auto-wake and sleep functionality. It’s compatible with the iPad Air (I hope we’ll see one for the Retina iPad mini soon) and priced at $100. You can see more detail and place an order at the VersaKeyboard product page at Moshi. I backed the Crux Skunk iPad keyboard case project on Kickstarter almost a year ago. I thought it looked like one of the most impressive iPad keyboard cases I’d seen, and it offered some impressive sounding features – a notably slim design, a 360 degree hinge that allows for a great range of typing and viewing positions for the iPad, and a full-size QWERTY keyboard. — The packaging for the Crux Skunk is fairly nice. — The name feels bizarre to type and to to say. My daughter thought I was making it up as a joke. I wonder if there’s some cool back story behind it. — For my pledge level (I think it was $155) it came with an attractive black leather carrying case – a nice touch. — Getting the iPad into it the first time is a bit of a pain in the neck. You need to loosen a couple of bolts on the frame’s bottom holding clasps with a very small, included, Allen wrench; then insert the iPad, then tighten up the bolts and adjust as necessary until you can comfortably open and close the clasps to insert and remove the iPad. Not a big deal – but also not a super slick starting point. Logitech has unveiled a new line of keyboard folio cases for the iPad and iPad mini. They’re called the Keyboard Folio and the Keyboard Folio mini and, as the bit of the name would imply, they offer protection for the front and back of the iPad and iPad mini. And as you can see in the promo photo above, they come in a range of colors. They support the iPad’s automatic sleep/wake feature and offer a ‘traditional’ typing experience backed by the solid reputation of Logitech’s keyboard cases. The Keyboard Folio goes for $99.99 and the Keyboard mini for $89.99. Both are available for pre-order now, with the Keyboard Folio expected to ship in April, and the Keyboard mini in May. I ordered a dark blue Keyboard mini this morning. 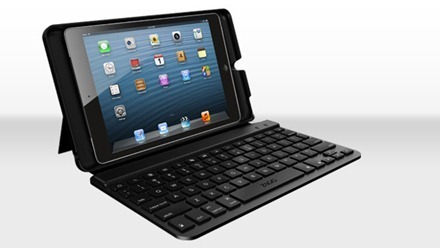 What do you all think of these new iPad keyboard cases from Logitech? This will make a lot of iPad keyboard case fans happy. 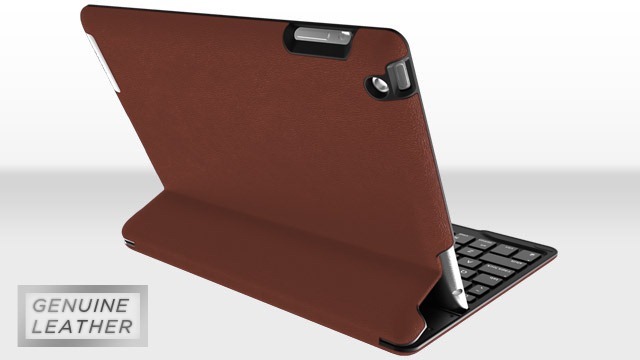 ZAGG has announced that their ZAGGKeys PROfolio+ iPad keyboard cases now come in leather. ZAGG”s keyboard cases have already proved popular with iPad users, and deservedly so – they generally offer the best keyboards in my opinion. I’ve used ZAGG keyboard cases with my iPad 2 and iPad 3 and liked them a lot. The only thing that prevented me from getting very frequent use out of them was that I disliked the hard, rigid cases. I actually detached the keyboard on my last one, and only use it outside the case these days. I’ve noticed that quite a few other people felt the same about the ZAGG iPad keyboard cases – love the keyboard, don’t love the case. These new leather models look like they may well change that sentiment very quickly. They go for $159 and come in a range of 3 clors – brown, red, and mocha. You can see more details or place an order at their ZAGG product page. Wow. I only just ordered the ZAGGKeys Mini 9 three days ago, and it’s already here. This is ZAGG’s new keyboard case for the iPad mini. 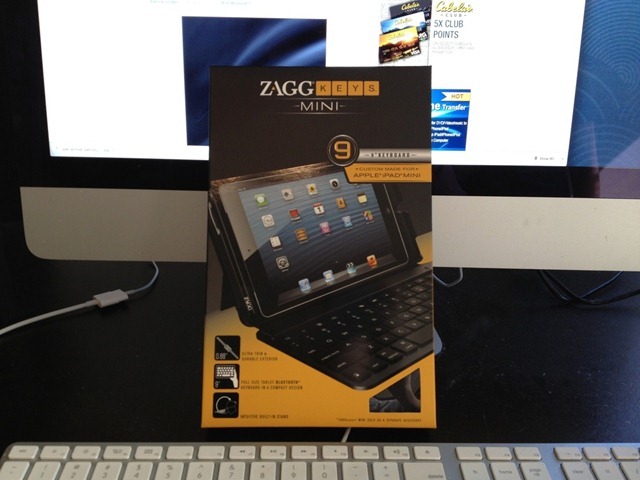 I chose the 9 model because it has the standard sized ZAGG keyboard – and I ‘m a big fan of their iPad keyboards. I haven’t even got the ZAGGKeys Mini out of its packaging yet, but I am very much looking forward to giving it a try very soon. ZAGG, makers of some of the very best keyboards and keyboard cases for iPad, are having a 50% off sale today. They’ve got a number of their popular iPad keyboard cases available at half price for ‘a limited time’. 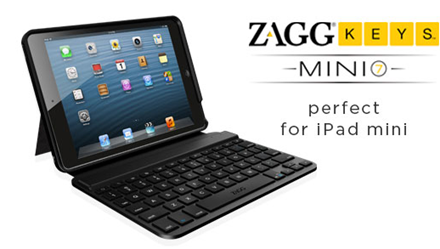 Included in the sale are their ZAGGKeys Mini 7 and Mini 9 keyboard cases for the iPad mini. I’ve been debating about whether to try a keyboard case for the iPad mini – and seeing this one at just $45 today was too good to resist. I just order the Mini 9 model. If you’re a fan of ZAGG’s iPad keyboards, or you’re just on the lookout for a good one for your iPad, today is a great day to check out this ZAGG sale. If you manage to pick one up, let us know in the comments. 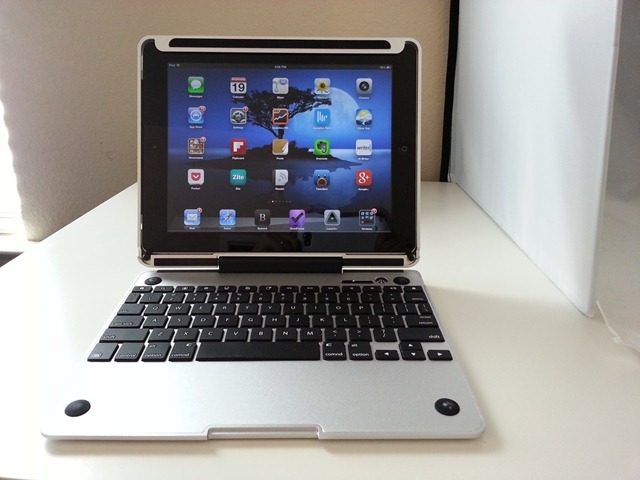 The Brydge iPad Keyboard is one of many iPad related Kickstarter projects I backed this year. As some of you may have noted two recent ones were major disappointments: the Human Toolz Mobile Stand for iPad and the Facet iPad Stand. Brydge is touted as an effective and unique iPad keyboard that will give your iPad a MacBook Air like feel. Brydge is a Bluetooth wireless keyboard for the iPad, made from ‘aerospace-grade aluminum that is machined and anodized to perfectly match the look and feel of an Apple iPad’. There’s also a black polycarbonate model available now. I got the standard aluminum model. Mine is a Brydge+ with the addition of a stereo speaker that’s placed at the top center of the keyboard. It is compatible with the iPad 2 and iPad 3rd and 4th generations. My model came with friction clamps on its hinges that are made to fit the iPad 2, with additional friction clamps included to fit an iPad 3rd or 4th gen properly. I have the iPad 3 so I switched them out and it was a fairly easy process. Brydge’s patent-pending hinge holds the iPad secure and allows you to position your iPad at nearly any angle, even allowing you to close it up entirely for easy transportation. Once closed, both your iPad and Brydge go to sleep automatically. Good news for those of you who backed the Brydge Kickstarter project. The latest update email to project backers says that shipping starts tomorrow – Monday November 19. The initial batch of units set to ship are those without stereo speakers. The company is hoping to have an update on shipping the units with speakers by the middle of next week. The Brydge is a very promising looking MacBook Air like iPad keyboard case that was big hit on Kickstarter and way exceed its funding target. I backed the project and I’m looking forward to seeing my Brydge – but I pledged for the model with speakers, so I guess I’ll be waiting a little longer. I know we have some Brydge backers here – if you receive yours sometime this week please let us know what you think of it. ZAGG are amongst the leading makers of iPad keyboard cases. In my experience their keyboards are the best out there when it comes to these combo keyboard cases for the iPad. Island-style keys in a sleek and unique layout provide maximum finger space in a compact Bluetooth® keyboard, perfect for accentuating the utility and convenience of iPad mini. Island-style keys with a carefully engineered layout to provide the same spacing as ZAGG’s traditional tablet keyboard. The compact Bluetooth® keyboard is perfect for accentuating the utility and convenience of iPad mini. So the Mini 9 is a bit larger keyboard with more generous key spacing, which is always a good thing. Both models come with a durable hard case that doubles as a stand and protects both the iPad mini and the keyboard. Both of these cases go for $89.99 and are listed as coming soon. You can check out full details on them and to submit an email form to be notified when they’re available at the ZAGG product pages for the ZAGGkeys Mini 7 and ZAGGkeys Mini 9. I got another Kickstarter update email about the Brydge iPad keyboard case. The project team’s status update included the news that packaging is complete and more. 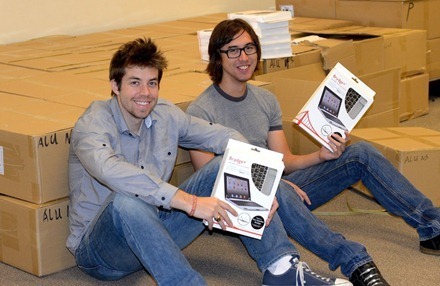 It also mentioned that a number of backers were keen to see what Brydge looks like paired with a white iPad. As you can see above, it looks great.